Hello my lovelies! 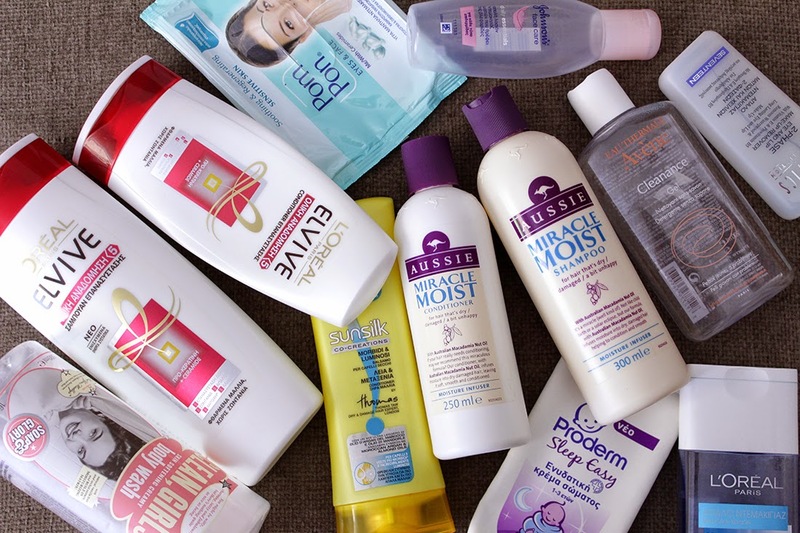 As you can see from the title this is going to be an "empties" post, I recently realised that I haven't done one in ages, last time I wrote one was in May and since then I managed to collect two whole bags of empty products! So I thought that including them in only one post it would be too much, so I decided to split them in two parts. This first part is going to be about hair and skincare stuff, and the next one is going to be again about skincare and make up. I got this huge shower gel last year when I visited London, the quality is amazing, very creamy and hydrating plus it has a masculine scent which is incredible unique. If I had access to these shower gels I would definitely buy one again. 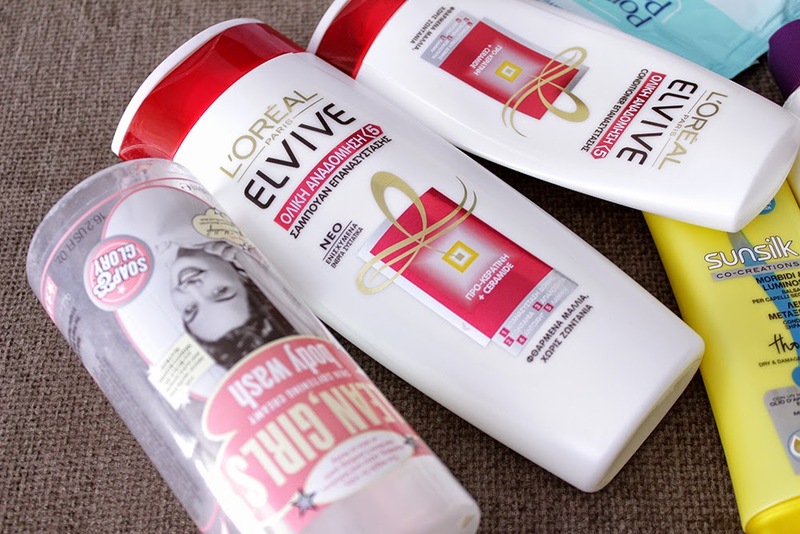 Elvive Total Repair 5 Shampoo and Conditioner. I don't have much of experience with Loreal's shampoos and conditioners, I find that this is an OK shampoo, I really liked the fact that it never made my hair greasy or dry, in my opinion it's perfect for normal hair, it's not moisturizing enough for drier hair. To be honest I liked the conditioner more, and I've already mentioned it in one of my monthly favourites post in the past, it made my hair super soft without making it feeling heavy or greasy. 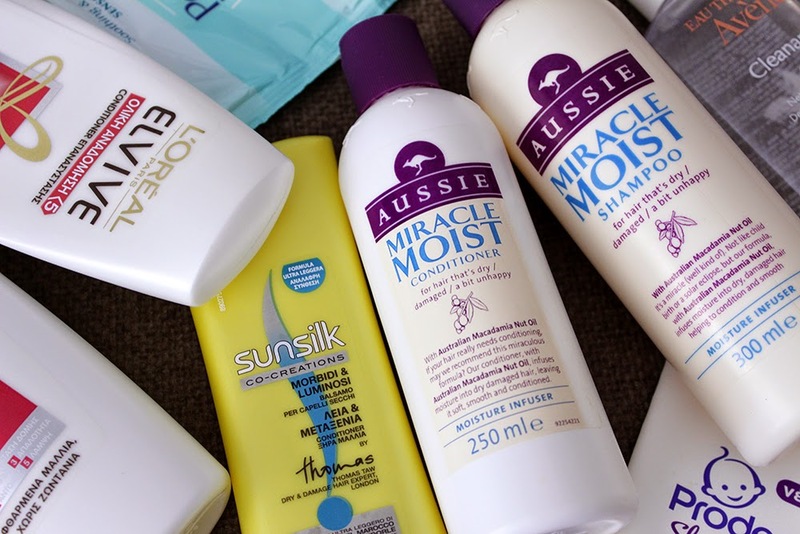 Ausie Miracle Moist Shampoo and Conditioner. It's very rare for a shampoo and conditioner to impress me but these two actually did it, I absolutely love them! Even though their name is "Miracle Moist" if you have dry hair you won't be pleased with the shampoo, it's not very moisturizing but for my normal to dry and fine hair it's moisturizing enough, and it leaves my hair really soft! I have to admit that I love the conditioner a bit more, and if I had to choose only one conditioner for the rest of my life it would be this one! It has a unique cream to gel texture but it manages to make my hair incredibly soft and detangled. I've tried almost every single of the Sunsilk conditioners and this one has got to be my favourite. I don't consider this as a conditioner but more of a deep conditioner or a mask because it's super hydrating, I've tried hair masks that hydrated my hair less than this baby did! But I had to be careful and use only a small amount of this otherwise it made my hair very greasy. I also loved the fact that it has an amazing warm scent, it must be the argan oil. 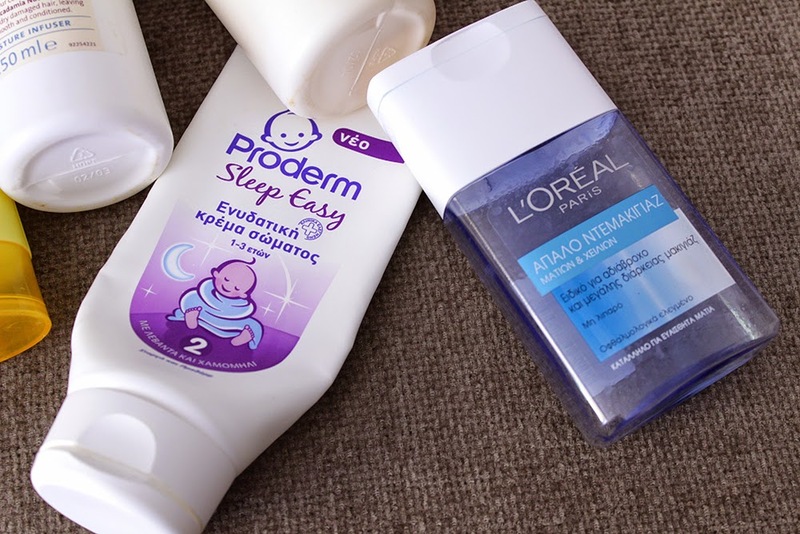 Yes I know that this is a baby body lotion, but I couldn't resist to the smell, it smells like..........I can't really describe it, but it smells like a baby and lavender, yeah I know I'm really bad at describing scents! It has quite a thick texture but it blends nicely into the skin and it never leaved a greasy feeling to my body. I recommend this to everyone that love baby lotion's smells in general, and to be honest with you I really want to buy the matching shower gel! This is by far my HG drugstore duo-phase eye make up remover! It even managed to beat my previous favourite, the Johnson's Gentle Eye Make Up Removal Lotion. It removes any type of mascara very easy and it leaves my eye area hydrated, also it never irritated my eyes. I've mentioned above that this used to be my HG favorite eye make up remover from the drugstore, and whenever I find it on sale I always grab one but to be honest it cannot beat the L'oreal waterproof one, and that's because is not as strong, it needs a bit more rubbing than the Loreal one to take off the eye make up. It's great for those who don't like the really oily dup-phase eye make up removers, and also for those who have sensitive eyes. I rarely use make up wipes to remove my face or eye make up, I prefer my Clinique Take The Day Off Cleansing Balm or a micellar water, but let's be honest, these wipes are so handy when you're away on holiday! So whevener I go away on a trip I always choose these ones, the Pom Pon Soothing & Regenerating for sensitive skin. 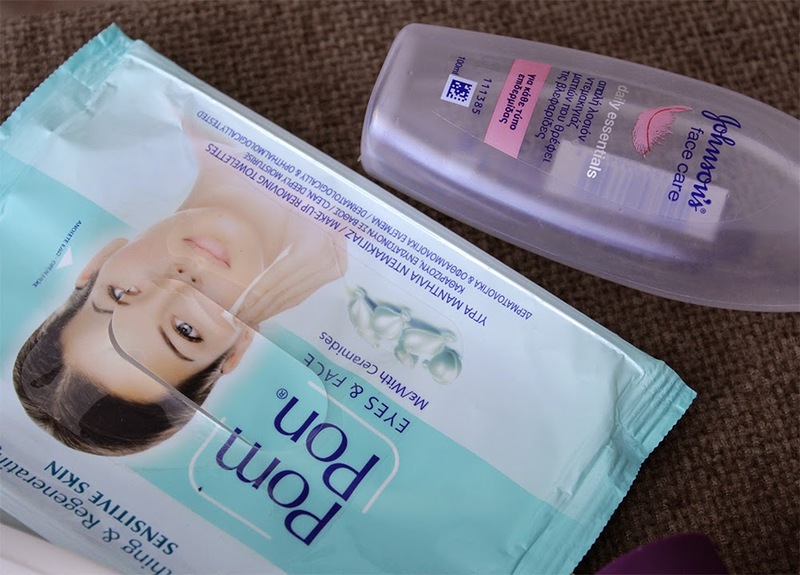 They're the best ones from all the make up removing wipes I've tried in the past, they never irritated my skin or my eyes like most wipes do and they're extremely wet, even after one month opened they're still very wet and that's quite impressing. If you're reading my blog long enough you'd propably already know that I'm using this cleansing gel for many many years and I've been through countless bottles of this baby. My skin changes quite a few times within a year, from super to oily to combination to dry, but since last spring my skin has been quite oily so I started using this cleansing gel again, it's the only one I trust for my acne prone skin. Yeah I know, another eye make up remover but I go through them really quick so once in a while I like to try different ones. This one from Seventeen really dissapointed me, even though it's quite oily it failed to remove my eye make up quickly, and it's quite expensive for a drugstore eye make up remover so I don't recommend this one, the Loreal and Johnson's ones are way better. 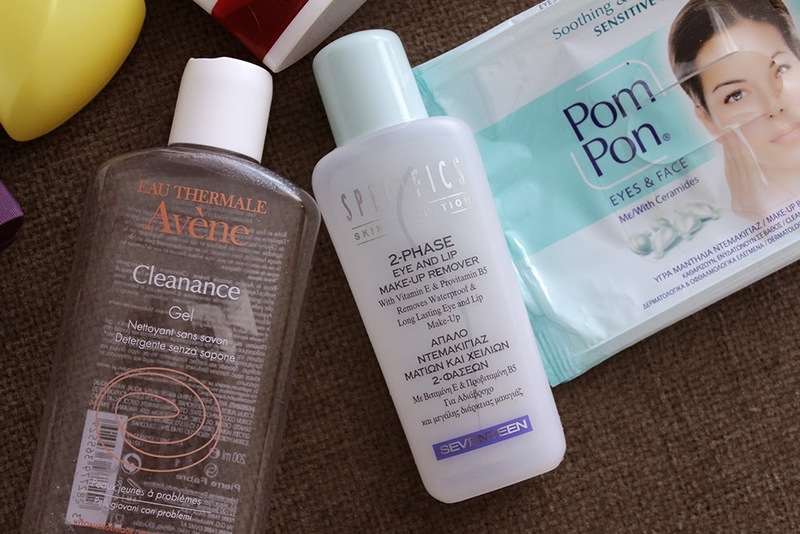 So that was the first part of my empties post, let me know if you've tried any of the these products, if you liked them or not. The second part with more skincare and make up stuff will be up really soon! The Aussie shampoo and conditioner caught my attention, I've tried some aussie hair masks so far and I love them! πολύ ωραια τα empties σου!!! φιλια!!! Fantastic post, I'll be waiting for the next part! Thanks! Ειναι τα καλυτερα, ειδικα το conditioner! I love sunsilk conditioners, especially those by Thomas Taw!